Hello friends In this post we are talking about free website builders. now a days when you have a business your online presence should be must. When you want a website for your business you will hire a web designer or developer and they will charge you based on your site demands. But now you can create your own site without anyone's help just by using the Online Website Builders. It is an automated software works very good it has prebuilt templates, images, layouts, social media buttons etc just you need to arrange as you like and brand your site. Ever you think of having or wanted to make free website? Then you will great to know that there are a lot of choices out there. You can have good platform and even get ideas for that and even saves a lot of time for investment on the websites and other stuffs. Having your own websites is a great way to reach out to new people apart from social media. You can have your different needs for your websites so it comes up from various styles and purposes, from personal blogs to corporate websites. Number of blogs are created using a free website builder offline as well as online. There are quite a lot of online website builders available, so I’m going to break my review of free website builder choices up over two blog posts. When you want to choose website builder keep this Four Important things in mind. Responsive Sites should be the basic need now a days your site should perform good in cross platforms so website builder should have responsive sites enabled. Porting the site to other host: When you want to transfer to other host or want an independent site free from website builder then you want all your files and folders as the backup that can be transferred to other host. So check whether the builder allows you to transfer your site. Modern SEO Techniques should be implement in order to get success like https is now a factor for Search Engine Rankings, Proper Meta Tags, 301 Redirection and other important things. Ecommerce should be enabled whenever you want to add a store to your site. Adding a blog to the site can increase your sales and traffic you can publish fresh articles relevant to your website and interact with your visitors. Well there are many but mostly used are Wix, Squarespace and Weebly as a possible website builder for you. Hundreds of templates to choose from. Not Having inbuilt analytics system to get stats of your website. Not having responsive site option. but has option for adding mobile site. Wix is one of the Best Website Builder Available online. first It offers free Account. Second Its site building interface is intuitive, very powerful and can be understand by beginner. It has Lot of Templates to choose from. Mobile site feature, video backgrounds, animated titles, mobile apps, third party widgets, you can even add a blog. Most of the designing is by easy drag and drop adding or removing anything to the site. This Fresh Website Builder has very clean Building Interface You can design responsive site which can look amazing in any device. It has powerful data analysis tool or site stats tool we don't need to depend on any third party site for stats. It has an option to integrate Social Media buttons. It also has an option for the store. Every Duda site will be hosted on Amazon Web Services Which is cloud based fast and efficient. It also feature a drag and drop editor. so no need of touching the code. It also has many widgets created by itself and many third party as well. You can import content from your old website to duda directly. and if you know coding then duda has developer mode for you. you can design your own layouts, widgets etc. If you are looking for a website maker, Weebly is the free website builder that can support to generate a store, edit a slideshow as well as modify your own theme for you. It is not like other free website builder having complicated or dull dashboard, Weebly is not only easy to use but also quite up-front. This reduces any possible worry for website designers new to the platform. Weebly also ensures that every task and interface is available without muddling the user edge. Aside from being easy to use, Weebly also has a lot varities of web sites like e-commerce, corporate, blog etc. Sitebuilder.com is another feature rich site builder this is also has drag and drop editor, It has 10,000 pre-made templates to choose from. sitebuilder.com also offers free email, Free Domain if you subscribed to their plan, You can also add store to sell products online. You can also add a blog to your site to keep your visitors updated with fresh content. SEO Tools are only available in premium plan and you cannot add ecommerce store in basic plan you should subscribe to much higher plan. In starter free plan you will not get mobile optimized site. Squarespace symbolizes the importance of building accurate and strong websites through every code inputted in the entire page. The codes are carefully reviewed, verified and reinforced, while every feature would work fine with testedso user can be sure that everything is seamless. With the kind of support and help it provides Squarespace is not only powerful, but it is also flexible to any type of content you can imagine. It seems as perfect, when it comes to a free website builder. Virb is one of the oddest website builders available in the market today. It feels different and stylish. It may blow you away with its striking templates. Like its generations, Virb is quite easy to use which uses a simple Microsoft Word/Wordpress type editor for standard content and dynamic content for pages. Although there are some limits to how much you can edit, Virb does have quite a lot of templates for users to pick and some of them can even be visible with a mobile theme version. Virb also cannot create forms for your website, or use other features like widgets. Voog Previously Edicy is quite a simple and good website builder with new features such as a labeling feature, site editor, ownership roles etc. This free website builder preferred choice for if you want to build multilingual languages content in a multitude of languages. Language can be easily selected by clicking the “+ Add” feature and then you let the system do the whole thing for you. Edicy allows you to see the changes immediately just to hover your mouse in the area you wish to edit. This interactivity gives Edicy an edge over others. This are some of the most popular website Builders Available but if you want your website builder to be added in the list then feel free to contact us we will review and add it. 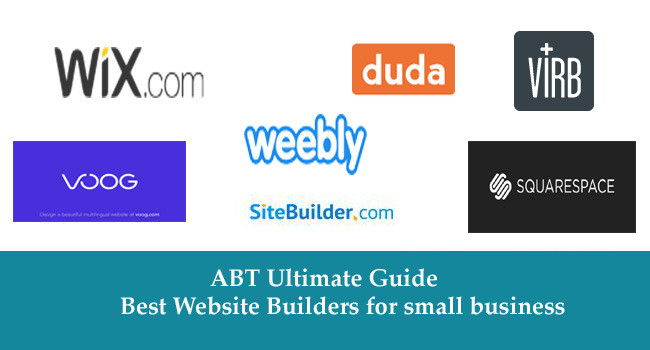 That's It Thanks For Following our Tutorial '' Ultimate Guide - Best Website Builders for small business 2017-18 '' Along With us If you found any difficulty Please Comment and Share Your Valuable Opinion. And Stay tuned for More Tutorials Like This and Share this with your friends.